Men's Two Tone Black Diamond Ring : LOVE2HAVE in the UK! 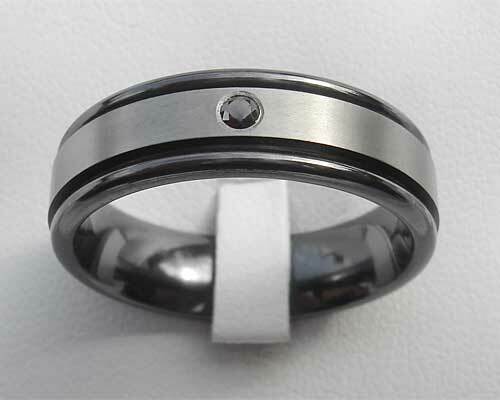 Here we have a men's diamond ring in a two-tone finish suitable for a wedding ring. It is a zirconium ring set with a single 6pnt (2.5mm diameter) black diamond that shines. 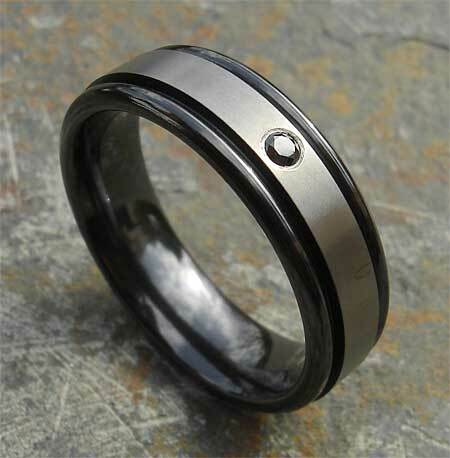 This ring comes in zirconium which is an excellent metal for creating men's two-tone wedding rings in black and grey. The two-tone effect on this ring is 'relieved' - whereby through heat treating the black coating is formed; the zirconium is then machine engineered away to reveal the original grey underneath. The inner section of the ring is the natural zirconium in a satin finish, and the outer rails have been left black. The ring itself is 7mm wide, but other widths are available upon request as well as different colour diamonds. Please email us for further details. Precious stone(s) Available: 1 x 6pnt (2.5mm diameter) black diamond. Profile(s) Available: Flat profile comfort fit. Finish(es) Available: Polished and satin matt combination. Returns Policy: You may return this item if it is not to your satisfaction as long as it is not engraved. Please see our terms and conditions. PRICE PROMISE: If you think you may have seen an item of jewellery on our website at a lower price either online or elsewhere, let us know, and we will price match like for like. YES! We can BEAT anyone. Please read through our terms and conditions before purchasing any of our jewellery. Registered office: Little Vauld, Marden, Hereford HR1 3HA United Kingdom. Company No. 05559123 | Love2Have Ltd.